Full disclosure: this was my first time making a pork loin roast. And guess what? I nailed it on the first try! And of course, I served it with my favorite kind of vegetable medley: a spiralized one. 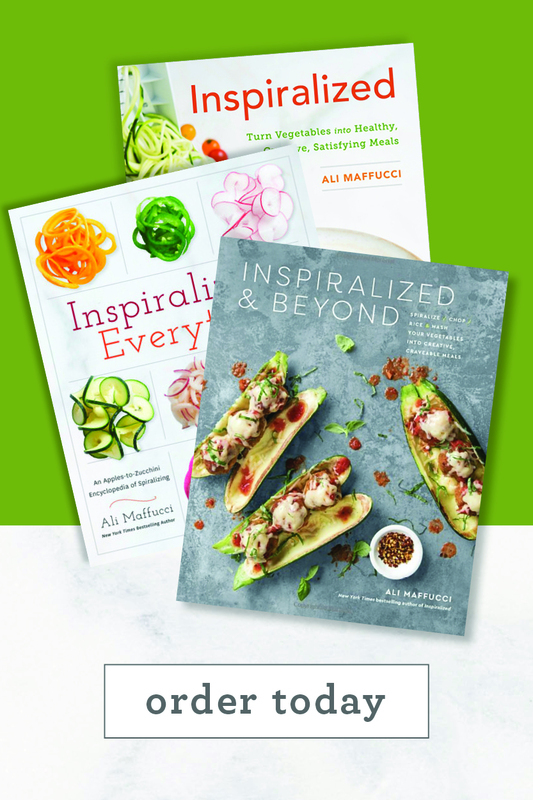 I’ve been loving the spiralized vegetable medleys lately (did oyu see my Roasted Spiralized Vegetable and Quinoa Bowl?) 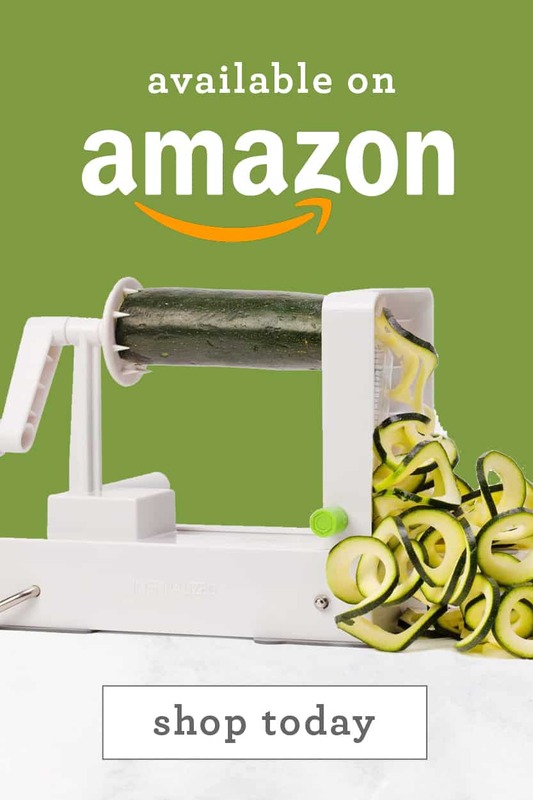 It’s an easy and colorful way to prepare vegetables and it’s more fun on the palate than some chopped veggies. We’re better than that! I love the seasonal flavors of this white meat pork roast – rosemary, garlic, salt, and pepper is all you need to season and then it’s popped into the oven for about an hour to cook and let the juices pop. After a ten minute rest, the roast is done and ready to be sliced and placed over a gorgeous bed of spiralized veggies. I used seasonal root veggies for the spiralized medley to help complement the rich flavors of rosemary and garlic. Other veggies that would work well here would be rutabaga, turnip, and carrot. I wouldn’t omit the onion – it adds a nice touch to the final flavors. 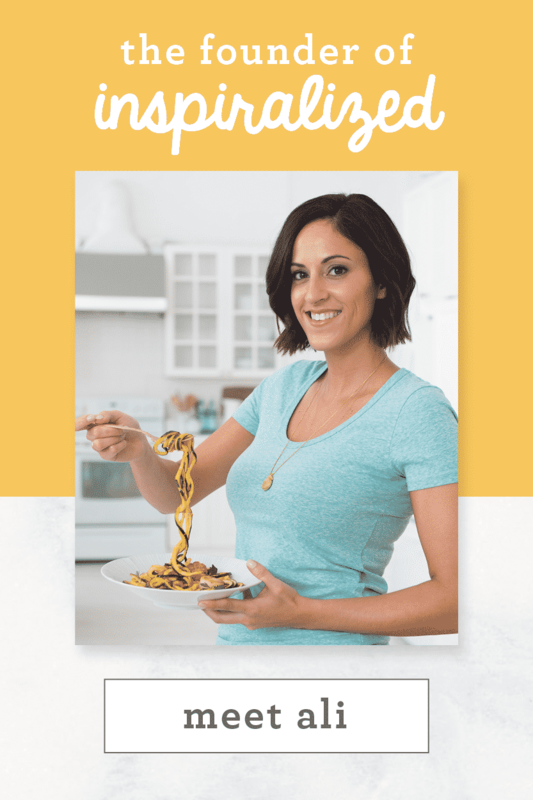 If you’re looking for a healthy meal to serve your family or an impressive dish for a dinner guest, this is it! Preheat the oven to 400°F. Line a 13 x 9 x 2-inch roasting pan with foil. In a small bowl, mix together to the garlic, rosemary, salt, and pepper. Using your fingers, rub the mixture all over the pork. Place the pork, fat side down, in the roasting pan. Roast for 30 minutes, turn over and roast for another 20-30 minutes or until pork registers at 155°F. Remove from the oven and let stand for 10 minutes. While pork rests, pour any leftover pan juices into a small bowl or gravy boat. After flipping the roast over, peel and spiralize the sweet potato (Blade C or D), onion (Blade A), and parsnip (Blade D). Lay the veggies out on a parchment paper lined baking sheet and drizzle with the oil. Season with thyme, salt and pepper and toss to combine. Roast for 15 minutes or until vegetables soften. When pork has rested, slice crosswise into 1/3” thick slices. 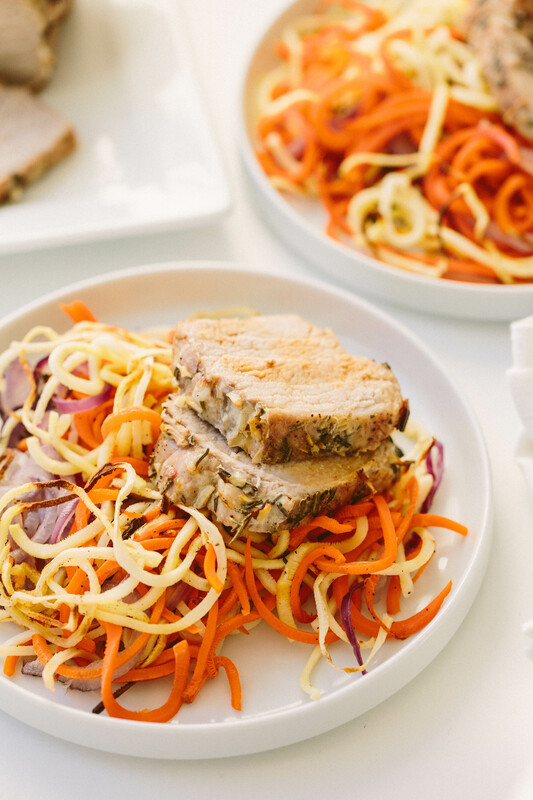 Arrange the slices on a platter and serve alongside the spiralized veggies. 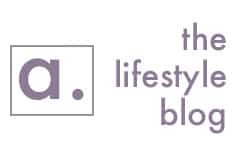 I recently came across your blog and I have to tell you how thankful I am. I am a diabetic undergoing chemo for breast cancer. One of the meds given to counteract nausea raises blood sugar levels tremendously. 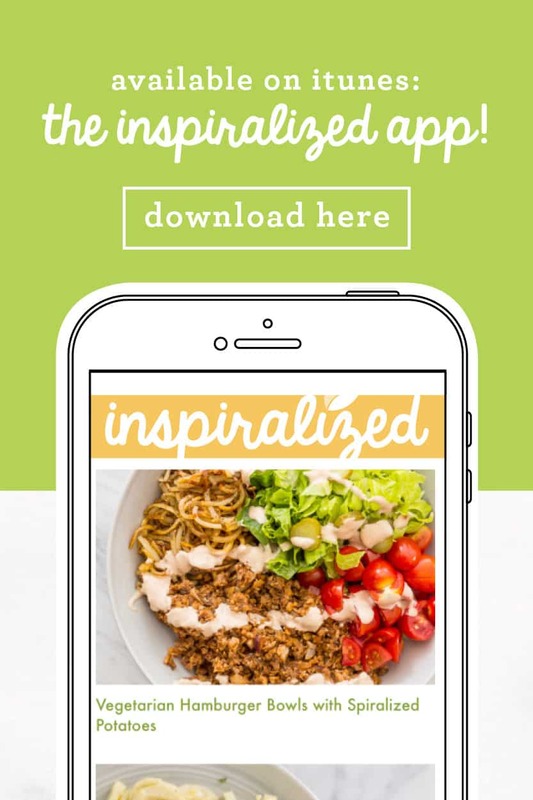 I had a really hard time keeping things under control--until I discovered your blog and the Inspiralizer. 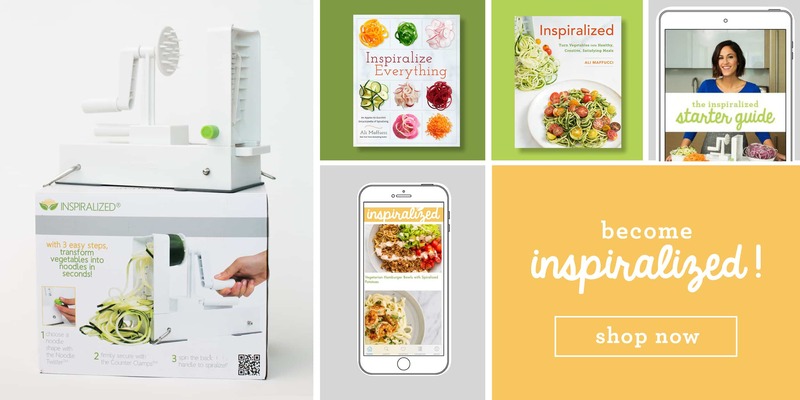 I bought the Inspiralizer and your two cookbooks and am following your blog. Thank you so much for including such complete nutritional info; the carb count is especially helpful for diabetics. 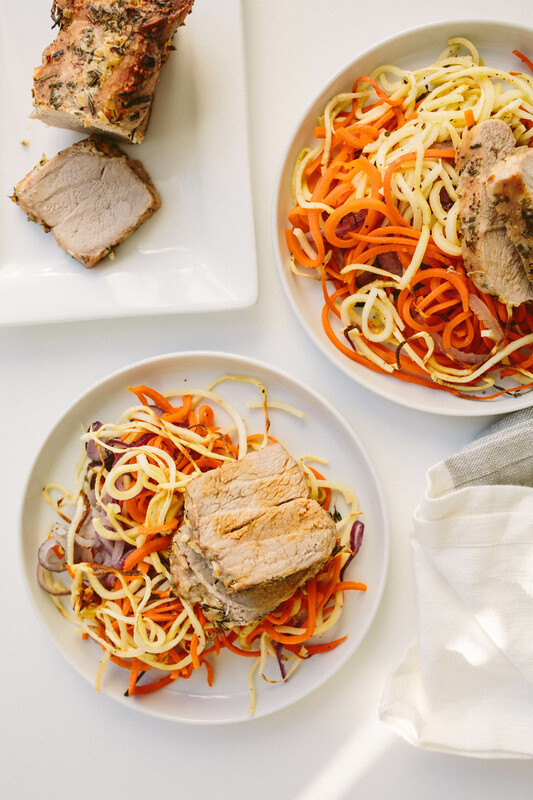 Last night I made the Pork Lo Mein (though I used leftover pork chops) and it was great. My husband and I both loved it. Tomorrow I'll try this Pork Loin Roast you've given here. 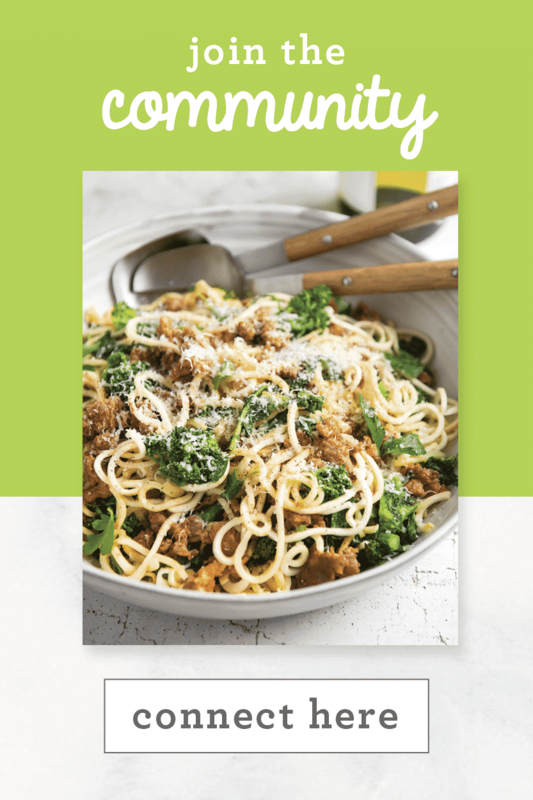 I'm also making out my Thanksgiving meal plan and you can bet there will be a lot of Inspiralized goodies to go with the turkey. Thanks again for all you are doing to helping us all eat healthfully and with enjoyment. 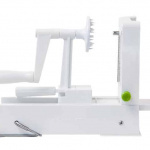 My spiralizer has 3 blades: noodles, spaghetti, and fettuccini. How would your A,B,C,D blades translate to these? 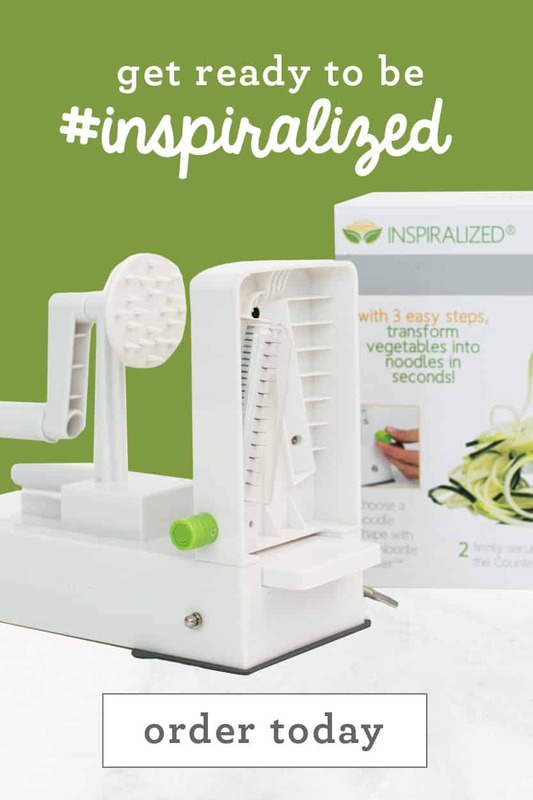 Hi Jill, we do not have a guide for other spiralizers, but do your best to match the shapes your spiralizer makes up with the ones made by the Inspiralizer. In most cases, noodle shape is personal preference!